When Andy decided to release "Dragon’s Fire" through iTunes, I downloaded the album with no hesitation. The three demo songs I reviewed some months ago really made anticipate for the full length album and now that I have it, I dare to say that this is one of the best albums I’ve listened to the last couple of years. Andy’s compositions are truly faultless on “Dragon’s Fire”! Having a gifted singer like Scott Board on the band’s marks (for those who don’t know, Scott sang on Cerebus’ “Too Late To Pray” album), the combination of brilliant guitar playing and triumphant, crystal clear vocals is what is needed for an album to become a classic one! It’s almost impossible to choose a favorite track in Dragon’s Fire: “Through The Eyes Of My Soul” has a riff that is inspirational, while the vocal lines makes want to listen to this pompous Metal Hymn again and again! “Evil Heart”, Dragon’s Fire” and “Devil In Disguise” are based on thunderous, pounding rhythm, while once again Scott delivers the message for starting the battle! “Battle In The Distant Lands” is once again triumphant epic opus with a Neo-classical riff that fits the song and a sing-along chorus! “From Hell To Heaven” showcases Andy’s abilities to compose more melodic-oriented songs and once again the result is astonishing! “Castle of Lost Souls” was once named “Desert Of Lost Souls” and is an instrumental based on Phrygian scales, while not neglecting a strongly Baroque influence, so you can understand that passion and inspiration here are quite high! I could write for hours and hours cosmetic words about this masterpiece that made me proud being a fan of this demanding genre of Metal music! Andy’s solos really sending each and every song to the next level and the most important thing is that he isn’t based on clichés in order to create a boring Power Metal album with intense Neo-classical melodies. Andy is truly one of the most inspirational guitarists and composers that I’ve listened in the underground scene!! The digital version of "Dragon’s Fire" has only one drawback, and this isn’t the quality of the songs. I’m referring to the bad production that the songs have and it really destroys in songs like Through The Eyes Of My Soul” the grandiose feeling that the composer want to create. I’ve talked to Andy and he told that he will personally remaster the CD before its normal release, so the people will have soon in their hands a true state-of-the art! 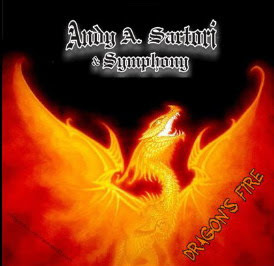 “Dragon’s Fire” is not only highly recommended, but its our duty to support gifted artists like Andy! Visit his mySpace profile: http://www.myspace.com/andysartori for all the latest updates concerning his next steps.